Bosler Memorial Library contracted B.R. Howard to conserve and repair damage that had occurred to their William Merrit Chase painting. The artist was born in Williamsburg, Indiana. As the oldest of his five brothers, his father hoped that he would join him in the women's shoe business. Chase resisted because he felt that he was born to draw. His world famous studio was located in the 10th Street Studio Building in NY. 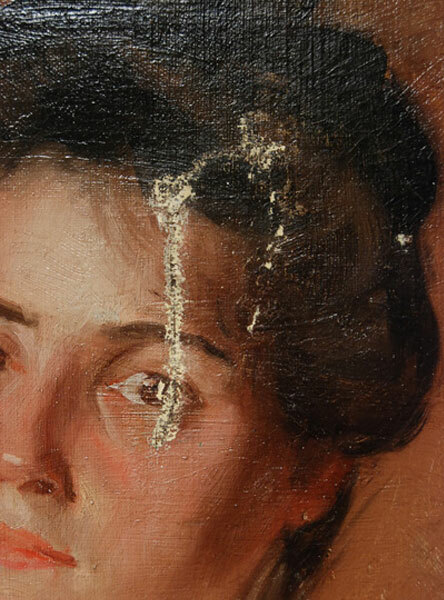 The painting was removed from its frame and the areas of flaking paint were consolidated to prevent any further loss. It was then surface cleaned to remove the grime layer and discolored yellow varnish. After the portrait was cleaned and consolidated, it was removed from its stretcher. The tacking edges were relaxed using moisture and were flattened. The torn edges of the were realigned and mended. The back of the canvas was gently cleaned using a vacuum attached to a rheostat. The painting was then placed onto a vacuum hot table and relined on a Belgium linen using a formulated wax/resin mixture. The Chase painting was then reattached to the stretcher and stretcher keys were applied. An isolation varnish was applied to the surface of the painting, and the areas of loss were in-painted using MSA Acrylic Paint and Maimeri Artist Restoration Colors. A final non-yellowing finish was then applied to the surface. The damaged frame was surface cleaned and areas of loss were filled with gesso. The missing ornamental components were cast with a 2-part carveable epoxy resin. The areas were then toned to match using Sepp Leaf Mica Powders.